Karedok is the favorite recipe of my late father who was a native Sundanese. No wonder wherever he's wandering arround, this special dish was never forgotten. Indeed I think it's hard to find any Sundanese people who doesn't proud of their "Karedok", ha ha ... Even my mother who is a Javanese, later has become a Karedok fans and long after my father has passed away she still keen to prepare this dish for me and my brothers from time to time. As i remember, our neighbours in my hometown in Kediri used to say " So this is the Sundanese "Pecel" ha ha. Well I wasn't surprised 'coz the look simply the same. ( Note : Pecel is other variant of vegetable Salad and it also serves with Peanut Dressing). But both have the most fundamental difference. 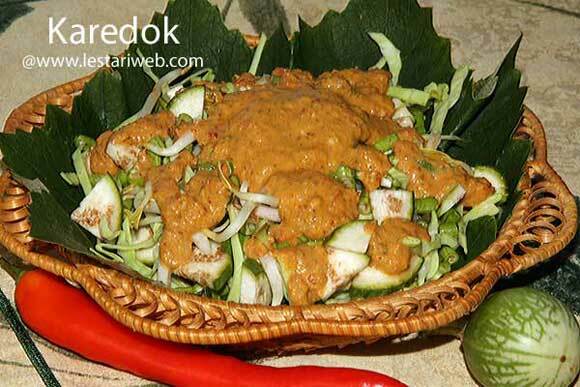 While Pecel is made from boiled vegetables, Karedok use completely raw vegetables, except the roasted peanut for dressing. Another important ingredient is Kencur or lesser Galangale. Honestly I would say, using a ground Kencur rhizome is the best way to get the optimum result but unfortunately I haven't seen it anywhere here in the west. The only possibility is using the dried rhizome or using a powder. And you have to get it though because this one can't be replaced with another subtitute. Without Kencur Karedok has lost it's character!! But don't worry.. the dried rhizome or Kencur powder can be found easily in most of Asia shops. Another small note, I haven't put indonesian Basil leaves this time because the stock was empty when I was making this recipe. It still taste good but try to get them when you have it arround because this leaf will provide a good charasteristic aroma of your Karedok. 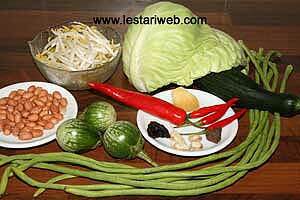 Peanut Dressing: Grind the chillies, kencur and dried shrimp paste in a mortar or grinding stone untill fine. Add the tamarind water, brown sugar, roasted peanut and grind all together untill smooth. (Other alternative: Put the mentioned above ingredients in a blender and blend untill smooth). Transfer in a bowl, add the hot water a little bit at a time, stir and mix them well with a spoon. Ensure you have a smooth thick sauce at the end. Add sugar and salt to taste. For vegetables: Wash and cut as required, mix them well. Put the mixed vegetables in a serving dish. Pour the peanut dressing over them. Mix them well. Garnish with basil leaves and serve with rice and kerupuk ( shrimp crackers) if you preferred.